"Society must insist on enlightenment - because anything may happen under cover of darkness"
On 8 January Olga Dianova and Sergei Kirillov, members of the Public Oversight Commission, conducted an inspection at penal colony No 19, near the town of Tavla, Sverdlovsk Region. When they were visiting the medical centre, where prisoners receive healthcare, they noticed that the thermometer in the corridor read + 3 degrees centigrade; it was barely warmer in the wards where the patients were. On visiting the cells where the healthy prisoners live one inmate complained to Dianova and Kirillov about the terrible cold in his cell. They checked. It was indeed very cold and they requested the colony administration to move that prisoner to another, warmer cell. They received a promise that their request would be examined. Thus far it remains unknown whether the prisoner’s request was met. In certain of the other cells the air temperature was around + 14 degrees centigrade. Many of the doors and ventilation panes there cannot be closed. That morning the temperature outdoors in Tavla was minus 33 degrees centigrade. Many prisoners complained to Dianova and Kirillov that they were subjected to violent treatment by the colony staff after talking to visiting members of the Oversight Commission [on a previous occasion]. Some prisoners were depressed because they were afraid they would face another beating after talking to the colony visitors this time. During this inspection the visitors also talked to a prisoner who had made three attempts to hang himself after suffering unlawful treatment at the hands of colony staff. All these infractions have been entered in the records of the Public Oversight Commission and in the Statement of Inspection which will be published later on the “rights activists of Urals” website. 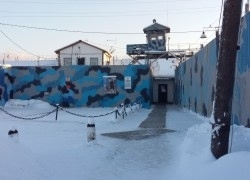 Those who conducted the inspection made an urgent appeal by telephone to the Regional Procurator’s Office and to the Sverdlovsk Region Main Directorate for Penitentiary Institutions to ensure that prisoners were not subjected to near-freezing temperatures and did not develop illnesses caused by over-cooling of their organisms. Appeals to the procurator’s office and statements to the courts will be despatched about these incidents.